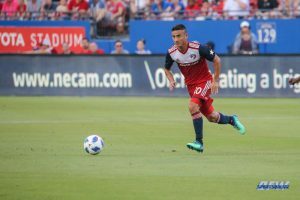 FRISCO, Texas – FC Dallas announced today the transfer of Mauro Diaz to Shabab Al-Ahli Dubai FC of the UAE Arabian Gulf League. Per team policy, terms of the deal were not disclosed. The 27-year old midfielder was in the middle of his sixth season with FC Dallas after joining the club in 2013. Diaz started 84 matches, recording 23 goals and 44 assists. He has played in 12 games in 2018, starting nine while registering two goals and eight assists. Diaz helped FC Dallas win the Supporters’ Shield in 2016 as well as the Lamar Hunt U.S. Open that same year. Shabab Al-Ahli is based in Dubai, United Arab Emirates and competes in the UAE Arabian Gulf League. The club has won seven league titles, eight UAE’s President Cup titles, four UAE super cup titles and three UAE League Cup crowns.